At their core, gutters are very simple: they collect rain water, and guide it to the ground below with ease. However, the dilemmas associated with gutters can be far reaching and unnecessarily tedious. If your gutters are clean, water will stream down the drainpipe when it rains (as it should). However, what happens if there’s an obstruction in the way? Say, a leaf clog or even oil seeping down from under your shingles? That’s a problem no one wants to have, much less have to fix. Obviously, the gutters need to be cleaned, but no matter how often you clean them, these problems are never gone for good. That’s where gutter guards come into the picture. No one enjoys cleaning gutters; it can be dangerous, dirty, and simply a nuisance when there are so many other areas of your home and yard that need some attention. Alex Higgenbotham, the inventor of gutter guard micromesh technology used by Leaf Filter and Mastershield, knows of these concerns all too well. In short, gutter guards proactively block leaves, pine needles, animal nests, and other debris from clogging your gutters, and heated gutter guards prevent icicles from forming in the winter. There are multiple styles to choose from (including reverse curve, mesh, nylon, and foam-type), and each has their benefits (typically costs) and drawbacks (most still need regular maintenance). Working as a subcontractor, Higgenbotham began experimenting with filter technology at the request of a Virginia-area builder that grew frustrated with gutter guards that would break down after a year or two of use. His final result was a micromesh filter that has been adopted by nearly every major gutter guard manufacturer and retailer in the United States. Whatever style you choose, a gutter guard’s main purpose is to save time and money over the long run, while reducing safety concerns that arise when you begrudgingly trek up the ladder every few weeks (or walk under always-dangerous ice dams or icicles). 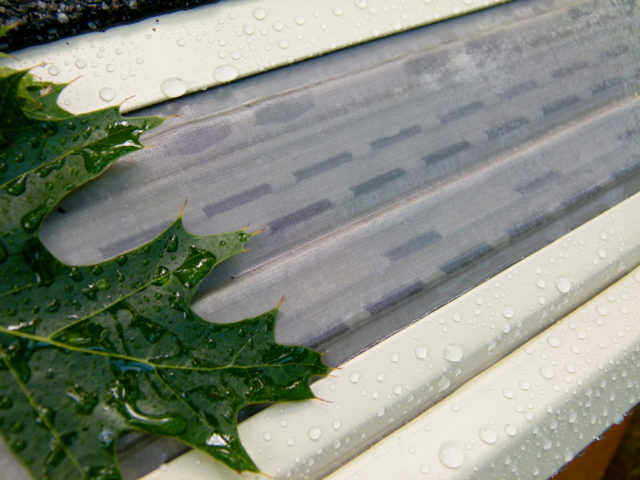 #2 – Gutter guards prevent puddles from forming inside the gutter, basements and on patios. By installing them and keeping the gutter functional, you will have the maximum benefit of the gutters themselves and provide protection from mosquitoes, weeds, grass and breeding bugs. #3 – Heated gutter guards efficiently and effectively reduce icicles in the winter and prevent water from freezing inside your gutters. They better disperse the heat through both the product and the surrounding air. You’ll also prevent a back up of water on the roof from cutting into the home. #4 – The best gutter guards are not only strong, but flexible. Since rigid products have no give and the filter is more likely to damage, it’s important to pick out flexible gutter guards (such as those made from aluminum) so that if a heavy branch falls, it’s more likely to bounce off, doing less damage. #6 – Gutter guards won’t void your roof shingle warranty. When shingles remain flat, they can bend, crack and break. Look for gutter guards that mirror the roof pitch and reseal any shingle that becomes unsealed during installation. #7 – A MicroVortex microfilter reduces the amount of water that flows over the filter, creating “underflow” to help clean the filter. Misdirected rainwater caused by full, leaky gutters can do significant damage to a home in a very short matter of time. It can cause toxic mold and mildew in just a matter of days, as well as permanent long-term structural damage due to water damage and rotting. Find a gutter guard that acts as a drip edge, mirroring the pitch of the roof and ensuring the water flows forward and away from your fascia board. #8 – Gutter guards save time and money. The initial investment of having gutter guards installed to protect your home’s gutters from clogging with debris will save both your own valuable time cleaning gutters, and the cost of a maintenance person handling the dirty job for you. It’s very easy to get sticker shock from the initial investment required with gutter guards. However, the long term benefits of doing so far outlast the short term costs. And when it comes to home improvement, isn’t that really all we’re looking for? Out guest contributor, Karen Sager, is the CEO of Mastershield, a New Jersey-area gutter guard manufacturer with dealers interspersed throughout the United States. EDITOR’S NOTE: Due to Alex Higgenbotham’s patented microfiltration technology, Mastershield gutter guards have been featured on Extreme Makeover: Home Edition and they’re rated the #1 gutter guard by Ask The Builder‘s Tim Carter.